Onion is a vegetable used in cooking and is full of healthy nutrients. Onion bulbs are extremely good for you because they contain antioxidants, vitamins, minerals, and amino acids. Consuming raw, cooked, or boiled onions can help you lose weight, boost your cardiovascular health, strengthen your immunity, and reduce inflammation. There are many varieties of onions, all with nutritional benefits. Onion bulbs can be yellow, red, or white, and range in taste from mild and sweet to sharp and pungent. All types of onions contain antimicrobial properties. But red onions contain more antioxidants than yellow onions or white onions. Onions are from the Allium genus that also includes vegetables such as garlic, scallions (green onions), leeks, and chives. In this article, you will find out why onions are so good for you and how scientific research backs up claims about the health benefits of onions. At the end of the article you will find how to use onions in home remedies. The most common type of onion used in cooking is the yellow onion. Yellow onions have white flesh and yellow skin and generally have a sharp flavor. Usually, yellow onions become sweeter and softer during the cooking process. What is the difference between white onions and yellow onions apart from their color? Most people say that white onions have a milder and crispier flavor than yellow onions. Red onions are sometimes referred to as purple onions and are usually eaten raw in salads. Most people prefer to eat red onions raw rather than yellow onions as they aren’t as sharp and astringent. 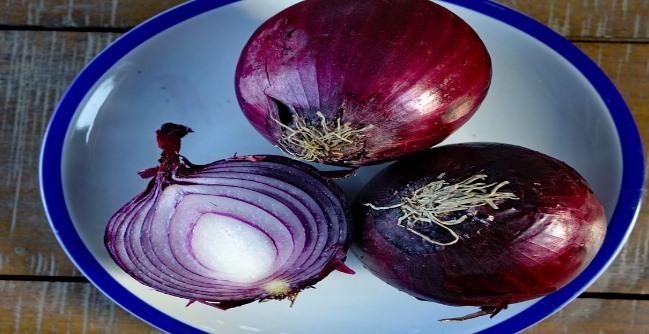 Red onions could be the healthiest type of onion as they contain more antioxidants. There is little difference in nutritional value comparing yellow, white, and red onions. All varieties of onion are healthy because they contain vitamins, minerals, and other beneficial micronutrients. 100 grams of onions contain 9.3 grams of carbs and around 4 grams of sugar. However, depending on the variety of onion, the sugar content of the onion could differ slightly. Red onions, white onions, and yellow onions all contain trace amounts of vitamins C and B-group vitamins, as well as minerals such as calcium, iron, manganese, and magnesium. Regularly consuming raw or cooked onions in your diet can also help to keep you healthy and boost your body’s immune system. Are onions healthy? It is clear that onions, especially the red and yellow varieties, have the potential to treat many health issues. Let’s look in more detail at why eating onions is good for you. The rich antioxidant content in onions means that eating onions is good for your cardiovascular health. Further reading: The best foods you can eat to keep your heart healthy. It is a good idea to eat onions every day if you have high blood pressure because onions may help to lower hypertension. Learn about other ways to lower your blood pressure without medication. Another reason that eating more onions is good for your heart is that onions have anticoagulant properties. Are you showing signs of poor blood circulation? Learn what to do to improve your circulation naturally and keep your cardiovascular system healthy. Onions are good for you because eating them improves your cardiovascular health because they help to lower serum cholesterol levels. Learn about other effective ways to reduce high cholesterol naturally. Drinking onion skin tea regularly can help you shed extra pounds of excess body fat. To use onion skin tea for weight loss, make an infusion by steeping the skins from one onion in a cup of hot water. Drink 1 or 2 times a day to help boost the effects of your weight-loss program. If you don’t like the taste of onion skin tea, find out how to make delicious ginger tea to help burn belly fat. Many of the health benefits of onions are due to the fact that they contain antimicrobial properties that kill various types of germs and bacteria. Onions contain beneficial compounds that are good for your digestive system. In fact, consuming onions could help to prevent Clostridium difficile-related diarrhea (a bacteria that causes inflammation of the colon). If you feel your digestion isn’t working properly, there are many ways you can improve your digestive health and keep your bowels working properly. Eating raw vegetables like onions is good for you because they help to strengthen your immunity and help your body resist infection. Find out about 10 steps that can boost your immunity today. You can also prepare at home this wonderful health tonic which combines some of nature’s most potent plants, including onion, and brings them together in a powerful concoction. It is 100% natural and works as an anti-bacterial, anti-viral, anti-parasitic and anti-fungal substance. Consuming onions every day in your diet can also help reduce inflammatory responses in your body. Although short-term inflammation is necessary to fight off infections, long-term inflammation can lead to chronic disease like diabetes, heart disease, and cancer. Did you know that onions are just one of the many foods that reduce inflammation in the body? Adding more onions to your diet is good if you have diabetes because onions help to regulate blood glucose spikes after eating. If you have type 2 diabetes, find out about other foods that can help to regulate blood glucose levels. Compounds in onions like antioxidants and flavonoids can also protect bone health and prevent the development of brittle bones later in life. Further reading: 4 natural ways to prevent osteoporosis in later life. Consuming onions has many benefits for men because flavonoids in red onions help to prevent certain prostate problems. If you are a man, find out how to spot the first signs of prostate cancer, as early detection decreases the risk of complications of cancer. Onions are an extremely rich source of beneficial antioxidants that have potential use in cancer treatments. More research still has to be done to find out how much onion to consume daily to help reduce your risk of cancer. Scientists also still have to research how other nutrients affect the cancer-protective effect of onions. Find out about other foods you can add to your diet that can help prevent cancer developing. Onion juice can help you re-grow your hair and make it stronger. The onion juice improves blood circulation and provides the hair follicles with sufficient nourishment. Onion also has anti-bacterial properties, so it helps with scalp infections that might contribute to hair loss. In 2002, the Journal of Dermatology published a small study that looked into the use of onion juice for alopecia areata (an autoimmune disease that presents with patchy hair loss). You can find detailed information on how to make onion rinse for hair growth and frequently asked questions in my article “How To Make Onion Juice For Hair Growth & Strong Hair“. The sulfur compounds in onions are anti-parasitic. Onion juice is very effective for intestinal worms, especially tapeworm and thread worms. According to a study published in the journal Parasitology Research, onion extract was effective in reducing the number of parasites in animals. In the study, ground onion was added to coconut flakes and food. The result was that all signs of parasites were nearly eliminated in stool samples. (44). You can also consume other foods and herbs that naturally kill intestinal parasites. How Long Are Onions Good For? Onions should be stored in a cool, dry place where there is plenty of ventilation. You should also avoid storing fresh onions in plastic bags as they will tend to rot quicker. Instead, store them in a mesh bag or a loosely covered paper to allow for air circulation. Whole onions when properly stored, can last for 2 to 3 months in the refrigerator. According to Drugs.com, clinical trials are lacking to provide dosage recommendations. However average daily doses of 50 g of fresh onion, 50 g of fresh onion juice, or 20 g of dried onion have been suggested. (46) 50 gram of fresh onion equals to about 1/3 cup of chopped onion. Onions are a delicious and tasty vegetable, and chopping, crushing, or slicing the onion root or bulb will add flavor and improve the taste of any meal. Eating an onion a day certainly isn’t bad for you and also comes with many health benefits. Of course, it’s not uncommon for onions to make you cry while you are chopping them. Eating too many onions a day could also cause you to have bad breath due to sulfides in the vegetable. (42) In fact, the smell of onions can also be emitted through your pores. Hard science has shown many benefits of onions, but there are “old wives’ tales” and anecdotes passed on through the generations that sing even more praises of these delicious root vegetable. In spite of being pure hearsay and not being backed by scientific research, many people swear by the following folk remedies. Why not give them a try and see for yourself? Anyone who has ever cut an onion in an enclosed room knows that it’s sure to make you cry unless you jump through hoops to prevent the acrid sulfur emanating from the cut onion from reaching your eye, such as putting on fans or submerging them in cold milk or water. Take half the onion and hold it directly below the irritated eye—careful not to touch! Let the tears flow and help to clear the debris from the eye. Grate and strain the liquid from one whole white onion. Brew a mug of peppermint tea. Measure out two teaspoons of onion juice and drink it down. After five minutes, drink the mug of tea. Repeat this process until vomiting stops and nausea ebbs away. With so many wart removal cures available over-the-counter that contain strong acids or freezing implements that can harm healthy skin around the wart and cause painful irritation, why not try for a gentler method that comes from nature—and is far less expensive than the pricey chemical alternatives. Cut a sliver of onion flesh just the same size as the wart. Place the onion onto the wart and secure in place with a small bandage. Change the onion piece and bandage daily. Within days, the wart will be gone. Another option is to use apple cider vinegar for wart removal. Carve up an onion, reserving the innermost core. Cut the core of the onion into an ear-canal sized plug, making sure it is long enough to grip easily. Place the onion core into your ear and leave it in place overnight. When you awaken, remove the onion piece and cleanse the ear. Your wax will come right out! Another option is to use this homemade garlic mullein oil for ear infection treatment. Using onions for treating the symptoms of common cold is an old home remedy which is attributed to the chemical compounds such as polyphenols, flavonoids and quercetin that research shows to have potential anti-inflammatory, antiviral and antioxidant properties. Pour the honey into a bowl and add the chopped onion and grated ginger. Leave the mixture overnight or at least for 6 hours. During this time the active ingredients in the onions and ginger will be released and absorbed in the honey. Chewing on onion is another tested home remedy. If chewing proves to be too painful for you, place a slice of onion on the sore area. Alternatively, you can extract some onion juice and dab it on. Shallots, red and yellow onions tend to be more effective compared to white and sweet onions. There are also other home remedies to get rid of wisdom tooth pain that you can try at home. Onion slices are a commonly used method for reducing the swelling and itching of mosquito bites. Simply place a fresh slice of onion on the affected area for a few minutes until the itching subsides. Then rinse with water. Or you can try other natural ways to relieve mosquito bites. Despite the lack of scientific evidence, there is anecdotal evidence about the effectiveness of putting onions on your feet to detox your body and to get rid of flu and cold. Slice an onion into a few thick slices about ½ inch thick. Place in a pair of tight-fitting socks. Put the onion in the socks, making sure the onions are tight against the bottom of your feet. Leave for a few hours to draw toxins from your body and to get rid of cold or flu. Onions on Feet or In Sock for Flu, Colds, Detox, and Infections – Does It Work? I love onions but they give me a lot of gas..
yeah that can be a problem…. ginger tea helps with gas.